We Are … Going to the Citrus Bowl! 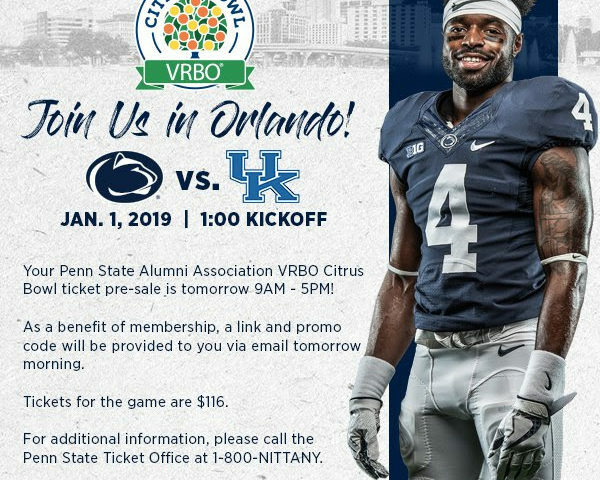 Join the Nittany Lions Jan. 1 when they face the Kentucky Wildcats in the VRBO Citrus Bowl to cap off another outstanding football season. Penn Staters can travel to Orlando with the Official Penn State Bowl Tour starting Sunday, Dec. 2. Packages include air and land-only options. Game tickets are included as an option for purchase on the tour from Anthony Travel (formerly PrimeSport), which is the official travel partner of the Penn State Alumni Association, the Nittany Lion Club, and Penn State Intercollegiate Athletics. Tour packages can be purchased directly at: PennStateSportsTravel.com. The official bowl tour will feature special Penn State events, including a pep rally for Penn State fans. Details for those activities will be available in the coming weeks. For questions about the Official Penn State Bowl Tour, call 866-373-7370. Eligible Nittany Lion Club Members—online pre-sale requests are now available and run through Monday, Dec. 3, at 5 p.m. Alumni Association Members—online pre-sale requests run Tuesday, Dec. 4, from 9 a.m. to 5 p.m., pending availability. General Public— sale begins Wednesday, Dec. 5, at 10 a.m., pending availability. Student Nittany Lion Club—online pre-sale runs Monday, Dec. 3, from 7 a.m. to 5 p.m.
Penn State Students—online sale begins Wednesday, Dec. 5, at 7 a.m.
For ticket questions, call 1-800-NITTANY or email GoLions@psu.edu starting on Monday at 8 a.m. until 5 p.m. every weekday.